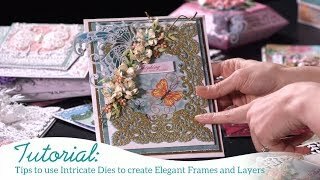 Add a touch of classic refinement to any paper crafting creation with the Eyelet Lace Frames Die! Often used to bring a touch of old fashioned charm, the use of eyelet lace never seems to go out of style and its design stands the test of time…as will this exquisitely charming lace like assembling of dies! Ideal for dressing up card fronts or creating fanciful card bases, these dies have been fashioned for use in the traditional style using all coordinating layers together, for use as separate embellishment pieces, or for creating unique configurations for a variety of stylish looks by mixing and matching the various layers! This fetching collection is surely one that you will reach for over and over again in the years to come!